To subscribe to our "Tech News" blog, click here and complete the form. 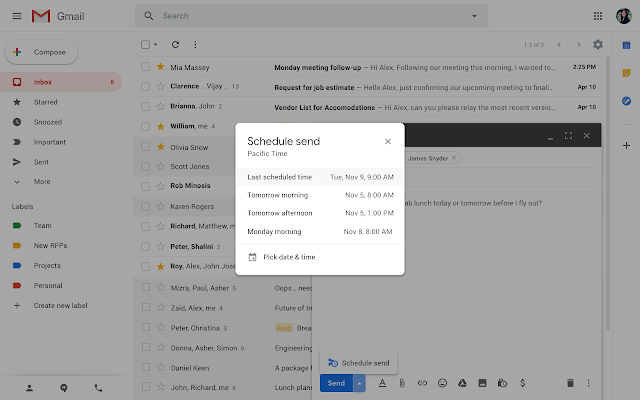 You can now schedule your emails in Gmail to be sent at a later date and time. Google are launching this feature on Android, iOS and Gmail on web. Just write your email as you normally would, then schedule it to be sent at a more appropriate date or time. This gives you greater control, allowing you to shift your work tome to wherever and whenever is most convenient to you and your recipients. Additionally, it's even easier to collaborate globally, allowing you to work across time-times while still respecting everyone's digital well-being. When drafting an original email or reply in Gmail, you'll now see an arrow next to the "Send" button. Clicking this arrow now gives you the option "Schedule send" option. After clicking "Schedule send", you can pick the specific date and time you'd like the message to be delivered. Also, you will noticed an additional folder named "Scheduled" will be added on your Gmail. Scheduled messages will appear in this folder while queued to be sent. Peek at calendars and automatically add guests - Now, when you add a calendar in the "Search for people" box, you can temporarily view coworkers' calendar. Creating a new event then automatically adds those people as guests to your meeting and might suggest a title for the meeting. More fields in the creation pop-up dialog - The Guest, Rooms, Location, Conferencing, and Description fields are now editable directly in the meeting creation pop-up dialog. Once you add coworkers' calendars, they'll load right right in the background, making it even easier and faster to find an available time for everyone. In preparation for the upcoming school year the Google Classroom team has announced a new Classwork and People page for the students and educators on your G Suite for Education account, as well as updates to the Classroom Stream. This notice alerts you to those changes. The new Classwork page lets educators better organize assignments and questions and improves planning. Teachers can group work into units or modules, and reorder work to match their class sequence. This helps simplify the class stream so it can be used as a conversational hub between educators and students. Teachers will be able to sign up for early access to the new features. Teachers who are using Google Classroom, you can now sign up for early access to the Classroom features like Classwork, People and Settings beta. General Access to the new Classwork page will be available from August 2018. Once available, the class owner will be able to opt-out of using the new Classwork page; this opt-out setting will be available for a limited period of time. People Page: We’re consolidating information to help educators and students get to what they need quickly. All information about class members - students, co-teachers, guardians - now appear in the new People page. Settings Page: On this page, educators can control all the settings for their classes, from updating basic class information, to controlling how students post in the stream, to resetting the class code. Stream Updates: With the addition of the Classwork page, the Stream’s purpose can shift to that of a conversational hub where educators can notify their students about upcoming deadlines, post announcements and more. Quiz integration: We’re making it easier to create formative assessments directly from Classroom. Teachers will be able to create a Google Forms Quiz from Classroom, and even lock the quiz for more secure and distraction-free testing on Chromebooks. Last year Google announced that the Drive desktop sync client for Mac and PC - a feature officially known as "Google Drive for Mac/PC" - would shut down completely on may 12th, 2018. They are encouraging enterprise organizations like us who are still using Drive for Mac/PC to transition to Drive File Stream. IMPORTANT: this shutdown has no impact on other Google Drive services. With Drive File Stream, you stream your Drive files directly from the cloud to your Mac or PC, freeing up disk space and network bandwidth. Because Drive files are stored in the cloud, any changes you or your collaborators make are automatically updated everywhere. You'll always have the latest version. You can also make Drive files available for offline access. These cached files sync back to the cloud when you're online, so the latest version is available on all your devices. Windows: Windows 7 and up. Windows Server editions are not supported. Mac: El Capitan (10.11) and up, For High Sierra (10.13). Download GoogleDriveFSSetup.exe or go to your Google Drive click on the gear Settings and click on Download Drive File Stream for Windows. (Optional) Delete the Google Drive folders at \Users\%USER%Google Drive. Use caution deleting this folder, as it may contain content that has not yet been saved or synced. (Recommended) Delete the Drive for Mac/PC and Backup and Sync applications. At the top left, go to System Preferences Security & Privacy. Next to "System software from developer 'Google, Inc.' was blocked from loading," click Allow. Here are some great keyboard shortcuts in Google Drive to make creating new items easier and quicker than ever before. If you ever have a Google Doc that’s tens or hundreds of pages long, it can be difficult to find a specific section of text that someone has asked you to reference. To save time, it can be valuable to provide a direct link to a specific paragraph in your document. Here’s how. Put your cursor at the start of the paragraph that you want to link to. Head to the Insert menu at the top of the page, and choose Bookmark. You will see that a ribbon gets inserted into the document where your cursor was previously. Now, when you send that link to anyone, the Doc will be opened right at the paragraph that you bookmarked earlier. A few weeks ago, Google released a new update for Google Forms. With this new feature, you can now insert images into survey questions or add images as multiple choices options. In the past, if you were using images in Forms, you would have used this button on the right-hand toolbar. But now, if you want to insert images directly into questions or answers, you need to access your images from a different place. When you type out your question, click the image icon on the right side. You can upload an image, take a snapshot, direct the form to a URL, browse your Albums or your Drive, or do an online search for an image. Once you upload or select your image, it will be incorporated right into the question. For example, let’s say you have a question like, “Which of the following images do you think best represents our brand?” and you want your answers to all be images. Click into the first answer space, and then click the image icon on the right-hand side. Upload or select your image. Repeat for the other answers. By doing this, you’re inserting the various image options as the answers in your multiple choice question, so that each answer is a different image. These buttons will appear when you are in Shared with me, Recent, Starred, or looking at Search results in Drive. When you select a document in one of these views, the below bar will appear at the top of your Drive page.
. Click this button to add the document to your Drive and move around to a folder where you can easily find it. Speaking of moving a document, a second button that has been added to the top bar of Drive is Move to. If you have selected a file and it is already stored in your Drive, then this button will appear. Additionally, if you’ve recently clicked the Add to Drive button, the Add to Drive button then converts to the Move to button. These two buttons will be available in the top bar of Google Drive in the coming weeks. Keep an eye out for the Add to Drive button in top bar of the Drive homepage, as well as in the top bar of the preview window. You can find the Move to button in the bar at the top of Drive homepage, or it may also be located under the “…” button, as highlighted below. If you don’t have the right software, filling out PDF forms on your computer can be a frustrating experience. Luckily, this (free) trick using Google Drive makes filling out PDF forms a breeze. Move the PDF into Drive > double-click the file to preview it > click the “Open with” drop down menu at the top. If you don’t already have DocHub installed, you need to click on “Connect more apps.” From here, search for DocHub and then install it. Once finished, go back to the same “Open with” drop down, and this time select DocHub. When you open DocHub for the first time, it’s going to ask permission to access your Drive. Click on Allow to proceed, and your file will open in DocHub shortly. The key to this app is that it allows you to draw text boxes anywhere you want on a PDF, which then just become fillable fields that you can type into as you like. You can slide these text boxes around and use the grid lines to assist you in positioning them. You can also use the check mark too for “checking off” boxes. There is also a great signature feature. When you click on the “Sign” button at the top of your screen, you can create a saved signature that you can use to sign documents. You can draw on the screen, use a page on your phone, or upload an image of your existing signature. When you’re finished filling out your PDF document, you have several options for sharing it. You can download it directly, share a link, or email it as an attachment. Did you know there are keyboard shortcuts specific to Gmail? Through a quick adjustment in the General settings tab, you’ll be whizzing through your email and will barely need to click your mouse. Many keyboard shortcuts in Gmail only require the touch of one button, so you don’t need to memorize too many key combinations. Go to settings in the top right corner of your Gmail. Under the General tab, scroll down until you see Keyboard settings. Select “on” to turn on keyboard shortcuts. Scroll and click Save at the bottom of the page. Your keyboard shortcuts are now enabled in Gmail. The C key opens up a new compose window. The D key opens up a new compose window in a new tab. When you’re sorting through your emails in your inbox view, or when you’re viewing a specific email, use these keys to move up and down your inbox. To expand a certain email, hit enter. When you’re sorting through a conversation, use these keys to move up and down your conversation. To expand a certain conversation, hit enter. When you’re in your inbox view, hit S to star an email To remove the star, hit S again. If you hit S again and quickly after the first time, the yellow star will turn blue and you can key through several options. When you’re in your inbox view, hit # to move an email to the trash. Note, that using # requires you to press Shift first. The # symbol is located on the 3 button. When you’re reading an email, or have an email selected, hit Shift and then U and the message will be marked as unread. When you hit these keys in this order, your inbox view will show all starred emails in the Starred folder. When you hit these keys in this order, your inbox view will show all drafts emails in the Drafts folder.